Its teacher appreciation week. I hope everyone is appreciating their favorite teacher. I was talking to some friends that teach preschool for different school systems. The subject of appreciation, leadership, and how to effectively manage to get results, came up. These are some of the things we agreed make for a great manager. SMILE it won't hurt you to show that you are happy with your job, with life, with the person you manage. Make the smile genuine. People can tell when you are being fake. You catch more flies with honey. Its an old saying, but its true. If you want someone to do something ask nicely. No one likes to be talked down to or talked snotty to. Don't forget your manners say PLEASE and THANK YOU. Remember people have a CHOICE about where they work. If you are unpleasant to work with, they may find somewhere that isn't a pain. Raises are nice and in today's world a necessity. Again if you continue with holding them you may not have an employee to with hold them from. Encouraging words create a pleasant environment. If people check their email or voice mail and refer to it as "hate mail" because all you ever say is negative complaints they won't work as hard for you as if you occasionally say wow great job, I'm proud, etc. Take the same advice with dealing with teachers that we give them for dealing with children. catch them doing something good and praise them. They will work extra hard next time to get more praise. Provide the materials that they need to do the job to your standards. You really need to treat people like you want to be treated. Think about what motivates you and try it with your staff. Make them want to do their best for you. 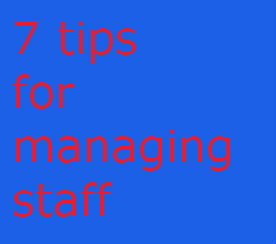 Following the 7 keys to an effective manager will get you started. Now go out and appreciate some teachers!